See more objects with the tag circles, personal, multicolored, timekeeping, personal adornment, hands, blue plastic. See more objects with the color darkslateblue darkslategrey grey midnightblue dimgrey or see all the colors for this object. This is a Watch. It was manufactured by Swatch. It is dated 1995 and we acquired it in 2010. Its medium is plastic, metal. It is a part of the Product Design and Decorative Arts department. The ubiquitous Swatch watch is manufactured by the Swatch Group, a Swiss conglomerate whose name is derived from a combination of the words “second” and “watch.” The company introduced its first watches in 1983, at a time when digital timepieces were enjoying wide popularity. Intending to re-popularize the analog watch (which first appeared in the 17th century), Swatch developed a range of low-cost, high-tech, artistic and fun quartz-powered wristwatches in bold designs made of bright synthetic materials. Technical innovations included an innovative ultra-sonic welding process, automated assembly, simplified gearing, and a reduced number of components; Swatch was able to decrease the 90 or more components typical in an analog watch to just 51, with no loss in accuracy. The first Swatch collection consisted of 12 models and was a resounding success. 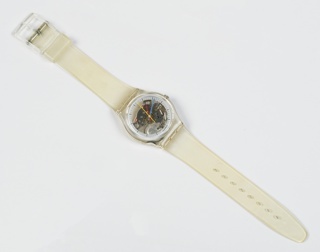 The company introduced a second collection in 1984 that sold over two million watches. In response to the growing popularity of their timepieces, the company decided to bring out two new collections of 70 models each year, each model chosen for a specific statement in terms of originality, controversy, or interpretation of fashion. Swatches appealed to consumers not only as reliable and low-cost timepieces, but also as collectable fashion statements and design objects. By the late 1980s, the company was commissioning artists and designers, such as Keith Harring and Alessandro Mendini, to create individual watches or entire collections. Swatch also began producing Specials, which are models with a specific theme created to mark an extraordinary person or event. These are produced in limited, numbered editions, and are never re-issued. This UNlimited chronograph is a Special that was produced to celebrate the 50th anniversary of the United Nations in 1997. The typical form of the Swatch—a circular face, thin profile, and simple flat strap—is unchanged, but the design is enlivened with bold colors. Green and blue predominate, with splashes of red, yellow, black, and white. Imagery of clasped hands represents the idea of international solidarity. Swatch selected Young Aspirations/Young Artists (YA/YA), a New Orleans-based program that promotes the work of young artists, to design the watch. This watch represents an icon of watch design and would enhance the historic continuum of the museum’s collection of timepieces. 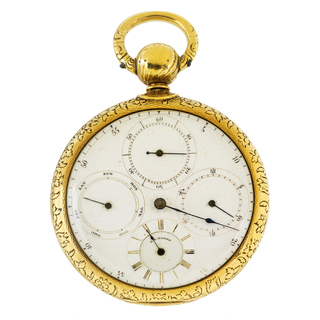 This object was featured in our Object of the Day series in a post titled A Watch To See. It is credited Gift of William Drenttel.